What are the Best French Door Refrigerators? Purchasing a new French door refrigerator offers a greater array of experiences when it comes to owning a fridge, particularly in this day and age where technology is improving many aspects of our everyday lives. Owning a fridge has become a common occurrence in most houses, however there is much more to storing food than just owning a fridge outright. One such fridge design is the French door fridge, which has been available since the late 1990’s for the regular two-door, bottom freezer design, with four-door French door style becoming available in the past 10 years. With that in mind, both offer a great addition to the range of freezers available and contain many benefits and features that make them very desirable in the home and also easy to maintain. What are the reviews of the best French door refrigerators? This super capacity refrigerator boasts of a whopping 31 cubic feet of storage space. With that amount of space, you’ll be able to store a month’s worth of food, depending on the number of your family members and your lifestyle. Features: This size is great for huge families, starting from four family members onwards and for homeowners who like holding parties in their homes, as they will be able to store a lot of leftovers in case. The wide shelves are able to hold wide pizza boxes, large platters, and baking trays. It comes with a Slim Space Plus Ice System wherein the installed water dispenser and icemaker don’t occupy too much space. PROS: It has a door in door feature that lets you easily access the shelf where the drinks are usually paced. The opening is large enough to get jugs of milk, cans of soda, etc. The interior is lighted by bright LED bulbs that not only light the fridge but also make the food visually appealing. The freezer space is equally enormous and you can fit in kilos of meat without problem. It features several trays and racks that you can use to better organize the freezer. This way, you won’t have trouble digging for the item you’re looking for. Despite the size, this refrigerator is very quiet. CONS: Customers have mostly complained about LG’s customer and technical support. Calling and scheduling is a big hassle as it takes them days or weeks before they can actually give feedback. Once repairmen have visited and looked at your fridge, they will cite that some of the problems aren’t covered by warranty, meaning you have to pay for repairs and replacement parts. The size of this refrigerator is considered above average at 28 cubic foot. You’ll be able to place a lot of foodstuff and frozen items in it, which is perfect if you have a big family or you often hold gatherings in your home. Features: Despite the big size, Samsung promises that this French door refrigerator won’t take up too much space in your kitchen as the strong, thin-wall insulation technology gives you more usable space inside. It also won’t be the most energy-consuming appliance in your home because it is rated Energy Star, which is good for both the environment and your wallet. PROS: When you leave the door ajar accidentally, the fridge will ring a door alarm to immediately get your attention. There’s an external water and ice dispenser located on the door for easier access. These are built-in but don’t take up too much space inside. Bright LED bulbs also light the interior so you can easily find what you’re looking for. This refrigerator comes with a mid-drawer located above the freezer drawer that provides temperature control for your food storage needs with Meat/Fish, Cold Drinks, Deli/Snacks and Wine/Party Dishes options. The racks and dividers found in the fridge can also be customized for easier organization. CONS: Many reviewers complained about the refrigerator that stopped working or cooling. This won’t be very alarming if it is an isolated case, as there will always be defective products. However, the case of complaints regarding this issue is very high and considering the price you have to pay for this fridge, the risk is too big. Consider this before buying this refrigerator. Best choice: Pureza filters are dedicated to improving water filtration technology and providing clean water. Organic carbon block triple filtration technology that reduces chlorine and odor, reduces impurities in lead, iron, mercury and other contaminants, keeps minerals in the water, ensures refrigerator filtration, quality water and ice. 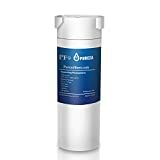 NSF 42 CERTIFIED: Pureza filters are tested and certified by NSF / ANSI 42 to reduce chlorine and have been tested and certified for lead-free compliance. Lead-free materials provide comprehensive protection for you and your family! This 23.1 cubic feet refrigerator designed to have a counter depth feature is perfect for those homeowners who don’t want to sacrifice looks with efficiency. With this refrigerator, you’ll be able to attain the “installed” look you’re aiming for while still having enough space for all your food and frozen items. Features: Counter depth fridges are the number one choice of homeowners who have very limited space in their kitchens as it is able to be pushed in between two standard sized counters and cabinets. Only the door protrudes, giving it a look that it has been customized. This is space saving as it is in line with the depth of your cabinetry. PROS: Despite being small than standard refrigerators that are about 25 cubic feet, this refrigerator can still fit in a lot of items through its tier storage system that can be customized according to your desired organization. It comes with a built-in icemaker, hot and cold water dispenser for added efficiency. It has LED interior lighting as well as an LCD control panel screen in front. CONS: This refrigerator is expensive considering the amount of storage space you get. For the price, you’ll be able to get a relatively large one, ranging from 28 cubic feet to 30 cubic feet. However, counter depth refrigerators are generally more expensive because of this feature. This refrigerator has a wide storage space at 27.7 cubic feet, perfect for big families. The glass shelves are tempered and considered spill safe because of the stopper surrounding it. This way not spills or juices would go on the other tiers. Features: It has a Space Wise Organization system that lets you move the shelves around or customize it according to the height and width of the items that you’re going to place. This way, you can maximize your space by organizing it according to your needs. There’s also a Cool Zone drawer, which is perfect for chilling drinks in a jiffy. PROS: This refrigerator has multi level LED lighting, dual icemakers, and water dispenser all installed for efficiency. The entire fridge is made of durable stainless steel material that will resist rust and corrosion. The freezer is roomy enough for all your frozen items and it is also divided by a freezer basket for easier organization. CONS: The installed icemaker and water dispenser seems very subpar, as it is very prone to leaks or breaking. At some point, customers complained about either the fridge not freezing enough ice or water leaks inside the main compartment. PureAir Ultra(R) Filtration System: Fresh air offers great taste. PureAir(R) Filtration removes up to 7 times more odor than baking soda to keep ingredients tasting fresh. This counter depth French door refrigerator is perfect for smaller kitchens as it can easily fit onto the depth of your standard counter and cabinets. When installed, it gives a really luxurious customized look. Features: This refrigerator comes with a Pure Advantage Filtration System that circulates filtered air all over the fridge to prevent odor and keeps your food items fresh and crisp. There’s also a so-called Humidity Control feature that keep your food stored under the correct temperature. PROS: There’s a so-called IQ-Touch control located on the side of the fridge that lets you control the temperature and display all options available. LED lights illuminate the interior of the fridge and tempered glass serve as the shelves that can be customized according to your organization needs. Drawers glide very smoothly so you can place or take out foodstuff easily. CONS: This fridge is small for the price that you’re paying for. 22.6 cubic feet is advised only for a family or four or less. More than that, you might have space issues. It’s also expensive, as you can get other models or brands at the same price but with bigger space. Key Takeaway: If you are on the lookout for the best refrigerator that is worthy of your hard-earned cash, it’s best to take a look at the list and read through the reviews so you’ll have an idea of the refrigerator you are eyeing, whether it suits your needs, wants, and of course, your budget. What should I look for in a French Door Refrigerator? One key aspect you should consider when selecting your French door refrigerator is how much space it will take up in your home; including the location that you will place it. You will want to ensure that you have enough space to house it, allowing for easy access when necessary and also out of the way of other appliances around the kitchen. Keeping it close to the eating area is also necessary, given its purpose. Not having enough space can lead to you being able to install your refrigerator, whilst having too much space can end up wasting availability for other components to the kitchen being used. Enough space should also be given to the opening and closing of the refrigerator doors, which partially links in to its size; a feature that is mentioned more in the next point. Differing from the storage space (which will be mentioned later on), the size of the refrigerator should be consider; it ties in directly with how much space you have. 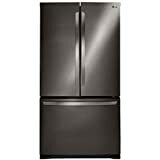 Most often a larger refrigerator will provide greater space and power, but there can be differing effects on the operation of the French door refrigerator. A larger fridge may be more cumbersome and not at all useful in a smaller home. It might not play in with the style of the kitchen. As well as this, whilst it is safe to assume a bigger refrigerator will provide bigger and better services, this may not always be the case, so it is prevalent to investigate the details further. Key Takeaway: Larger and bulkier fridges may sometimes drain out even more power than smaller ones, with a minimal increase in storage space. Not to mention, you’re also sacrificing valuable space in the kitchen. This wouldn’t be a problem if you have a big one but for a small kitchen, space is of absolute value. When you have a large refrigerator, you want to have one that has a size proportionate to your home as well as to the number of people that live in your home. It is unreasonable to purchase a large fridge for a home that has very few rooms, the same, as it is unreasonable to purchase a large fridge when there is only one person living in the home, or a small fridge in an attempt to accommodate a family of 5. Determining the best size of fridge for your family can be a bit of a challenge, so you will want to first look at your situation. How many people access regular foods and drinks from the fridge such as milks, cheese, breads, butters and other similar items? How often will family members have their own specialized foods that no other member eats? These are important questions to ask, as they will help determine the amount of space needed. Generally speaking, enough space for all the essential items is necessary, with the additional space being allocated for foods and drinks that are preferred by one person. Key Takeaway: If you have many family members who eat and drink a variety of different foods and beverages then you’ll want the space to accommodate it, however if everyone eats and drinks the same then having a smaller fridge will not make a great impact. 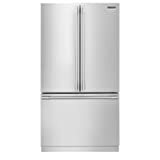 French door refrigerators are not cheap, ranging in prices up to the thousands. This is an expected price for an appliance of this capacity, particularly when they include additional features. You should expect to pay around $2,000 up to around $4,000 depending on how fancy you want you. In terms of satisfying the varying criteria mentioned when looking for the best French door refrigerator, $2,000 is the base price. Additional feature will incur additional cost. For instance, a counter depth French door refrigerator is condered smaller when it comes to storage space, but it costs more expensive than large refrigerators. This is because counter depth is considered a lux feature as it is meant to give your refrigerator a sophisticated “customized” look. You aren’t really paying for the added function here, but merely for aesthetics. Consider functions that would actually help, such as an icemaker and water dispenser that dispenses both hot and cold water. Some French door refrigerators have more energy efficiency than others. This type of information can be determined by verifying the electrical usage displayed on the appliance, on the official website of the refrigerator or on the product manual. In some cases you can also find details of energy efficiency on the standard details of the French door refrigerator. Energy efficiency is an important aspect to remember, as greater efficiency will result in more money saved for you. Key Takeaway: It can work in your favor, where paying a few hundred dollars more for a greater energy saving refrigerator can save you double that in the next few years and more along the track. It’s best to consult a salesperson or the manufacturer to determine how energy efficient your refrigerator is. 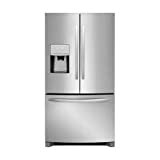 French door refrigerator styles should not be too important, unless of course you are adamant you want your kitchen appliances looking a certain way. The color and style of the refrigerator does not have any bearing over the operation or the efficiency of the appliance and merely serves as an aesthetic change to suit the wants of the consumer. With that said, in most cases you have a choice between either stainless steel, white or black. It is sometimes possible to get more vibrant colors however these are more often found in different types of refrigerators. The position of the handles on the French door refrigerator does not change, as they are inherent in the design itself and label as a “French door refrigerator”. However, you can get French door refrigerators with additional drawer instead of having just one that serves as the freezer. This other drawer can be used for chilling drinks, wine, and sodas but can also be tweaked to serve as a crisper for your fruits and vegetables. It is possible to purchase a French door refrigerator without any additional features, although it may be best to remain with whatever is offered. Some refrigerators offer an ice dispenser, whilst others also incorporate a chilled and/or heated water dispenser as well. You may also be fortunate to receive upgrades on the already present features in most refrigerators. Inventory management, smart control panel, LED lightning and other additions are all possible inclusions when you purchase a French door refrigerator. You may also want to consider getting extended warranty on your refrigerator. Although most come with a standard one-year manufacturer’s warranty, it may not give you enough peace of mind knowing that after a year, everything will be covered by you. Most appliance centers offer extended four-year warranty for only an additional hundred bucks or so. Key Takeaway: It is up to you to investigate what your refrigerator will include and if it has all the features that you want. In most cases it can take a little bit more searching to find one exactly, so a keen eye is well rewarded. With all of these details in mind, the task of selecting and purchasing your own French door refrigerators should be a much simpler and more enjoyable task, as all the information is there. You can rest assured that you know a lot more than you previously did and your new purchase of an excellent French door refrigerator will provide you with delicious and well-preserved food for many years to come.